Elton John, Eric Johnson and hundreds more. BK's designs and products have satisfied the most critical professional clients. With this vast experience and background in what sounds "right", BK knew it was possible to bring all the excitement of the "live stage" and the superior qualities of "recording studio sound" to the consumer audio market. Virtually all recording artists and sound engineers recognize the inherent superiority of vacuum tube equipment for recording, live sound reinforcement and musical production. The introduction of the original Tube Driver 1500 in 1996 began a new era of tube-driven amplification for cars. Shortly after the first production models were shipped, a group of veteran mobile sound professionals from Rockford Fosgate, PPI and others, joined to form a new company named Phaze Audio. At this time, Butler Audio was approached with the idea that it would produce the TubeDriver amplifiers and Phaze Audio would market and sell them. Butler Audio initially granted Phaze Audio an exclusive license for marketing and distribution of the Butler Audio line of TubeDriver amplifiers. 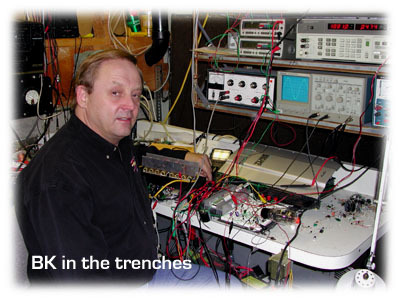 In the late fall of 1997, Phaze Audio was also granted a manufacturing license to produce TubeDriver amplifiers. In 1998, Phaze Audio saw a great opportunity for accelerated market expansion and purchased Precision Power, Inc. (PPI). After the acquisition, Phaze Audio/PPI decided to re-design the original Butler Audio TubeDriver amplifiers. In 1999, PPI came out with a line of amplifiers with tubes bearing the trademark "TubeDriver"; however, they are not BK Butler/Butler Audio designs and do not share in his original patented technology. Phaze Audio/PPI was purchased in late 1999, temporarly ending all further TubeDriver brand production and sales. Shortly after this, in early 2000, BK Butler reclaimed all of his rights pertaining to TubeDriver. With a clean slate, BK Butler began an all-new design that would ultimately incorporate his newly discovered Tube Driver BLUE thermionic technology. Often working 18-hour days in his personal lab, it's estimated that no fewer than 100 different prototype versions of this new technology were rigorously investigated and thoroughly tested. In the late summer of 2000, all these efforts finally paid off. An open-ended (ZERO negative feedback), 6SL7GT twin-triode tube-driven design operating in a near plate-saturated mode continuously, a totally unique load-mirroring circuit and employing no output transformers! This new design not only exceeded the superior sonic characteristics of the original TubeDriver 1500, but actually rivaled Butler Audio's laboratory "all tube" reference amps of the time! After many enhancements of the basic discovery were implemented, BK Butler was finally satisfied and designated the now patented circuitry as "Tube Driver BLUE". In late 2001, with the successful launch of the Tube Driver BLUE car amplifiers behind him, BK Butler decided to unleash a whole new generation of amplifiers that would bring the "live stage" and "recording studio sound" to the Home Theater environment. After receiving an enthusiastic response at the 2002 CES to the first prototype home amplifiers incorporating the now patented Tube Driver BLUE technology, Butler Audio introduced the Tube Driver BLUE series of Home Theater amplifiers. Now, in mid-2005, BK Butler is about to unveil the ultimate home audio amplifier. Dubbed MONAD A100, this incredible new technology will incorporate the now patented Tube Driver BLUE technology into a unique, single-ended Class-A audiophile-level monoblock design, housed in a collector-quality chassis and designed exclusively for the true audio connoisseur. Stay tuned for this and other revolutionary designs from BK Butler's lab.